Hi there nana-versal people! Are you all tuned up as always? 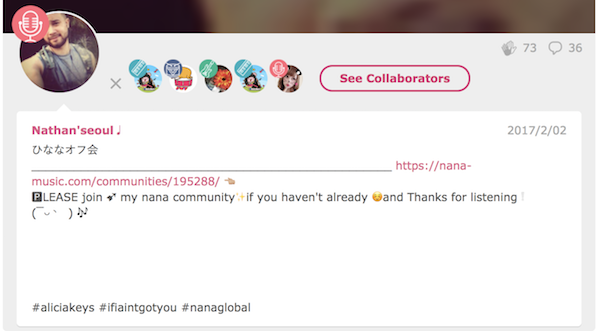 Most unique feature that nana has is “collab” by overdubbing your tune with others and play with it. However, it will be difficult if you can’t find the part that you want to collaborate with, and that will be the same for your potential collaborators… but don’t worry. By adding a little effort, you can make yourself discovered by your future sound buddies! In order to start that, today we will be explaining how to set up the “Part Icon” of your track to make yourself found easier by your potential collaborators! Your voice is the first instrument that you will make sound with. Select this icon if you’re into the main vocals for any type of music. Although not the main, if you are going to add pinches to the song, your part will be “Chorus”. Find yourself supporting other voices or creating unison together with choir people. Apart from singing tunes, you can use your voice to make people imagine lots of things. Put in expressions to the words you speak, and that will your piece of work without doubt. Be emotional, make imaginations. Long-loved classical to modern electric, you can show off your riff and backing by choosing this one. The team who wants to create band sound must put this on! If you’re into the rhythms for the band acting as the basement, you definitely need to select this one. The most important part, heart beating part for the band. Everyone awaits for you to create the beat out! Traditional part. Nothing more. Play the elegance out of your classical one, or mash it with other band sounds if you’re keyboard player! One of the most orthodox instruments from classical world. Be the one of the orchestral part with this icon. Another classical instruments. If you’re taking the part for the orchestra from violin to cello, use this icon! A bit different from drums, this percussion is for people who is fond of voice percussions and other beating instruments like jambe. If you’re with unique rhythm item, choose this one. This is for you all-in-one track creator. The main lot of background music creators are using DTM tools to make music. If you are one of them, choose this one and thousands of people will be able to discover you soon. Haven’t found any part that fits for you cause you’re making something totally new? Then set this up for your original sound! By setting up the part icon correctly, you can team up with other users to create an awesome sound. Here are some of the tracks that were created by collabs of users from different perfection. Click on their track, and listen up people! If you already have collaborated with talented users, share it with the world by looking here! !